Two diagrams from Ride the Tiger to the Mountain, a taijiquan instruction manual by Martin and Emily Lee. The first “figure shows the dynamic of yin-yang balance. The right side of the diamond follows the yang elements of T’ai Chi. The left side follows the yin elements” (p34). The second “figure illustrates the T’ai Chi fitness system” (p169). 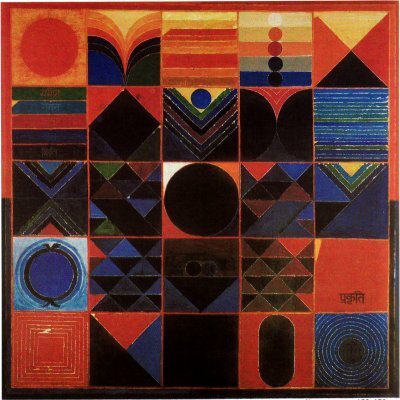 A painting by S. H. Raza, reproduced in Michel Imbert’s Raza: An Introduction to his Painting. Prakriti, 1999. Click for larger version. “Forms emerge from darkness. Their presence is perceptible in obscurity. They become relevant if their energy is oriented through vision into an alive form-orchestration for which certain prerequisites are indispensable. “The process is akin to germination. The obscure black space is charged with latent forces asking for fulfillment. Like the universal natural order of the ‘earth-seed’ relationship, the original unit, ‘Bindu’, emerges and unfolds itself in the black space. All inherent forces unite. A vertical line intersects a horizontal line, engendering energy and light. Space is charged. Contours appear: white, yellow, red and blue, and along with the original black, they compose the colour spectrum of the visible world. “The mysteries of form reveal themselves through light colour space perceptions. In a visible energy spectacle, certain fundamental elements are intricately interrelated and determine the nature of form. Their understanding is indispensable in any creative process. Whatever the direction art expression may take, the language of form imposes its own inner logic and reveals infinite variations and mutations. The mind can only partially perceive these mysteries. The highest perception is of an intuitive order, where all human faculties participate, including the intelligence, that is ultimately a minor participant in the creative process. This stage is total bliss and defies analysis” (p66/8).